New sketch groups at UCB prove uneven in generating comic heat. Pictured: Cantrell and Walker; Hot Sauce: Ozeri, Schwartz and Pally. A recent pairing of Hot Sauce with Walker and Cantrell at the UCB Theatre proved a little uneven. Sketch group Hot Sauce has the stronger show, yet is hampered by too much sheer gross-out material. Walker and Cantrell, the female duo performing in the second half of the sketch night, do a show that lacks focus and comes off like they wrote it as though they themselves were the audience for it -- meaning it’s so internal that only they themselves might find it funny. 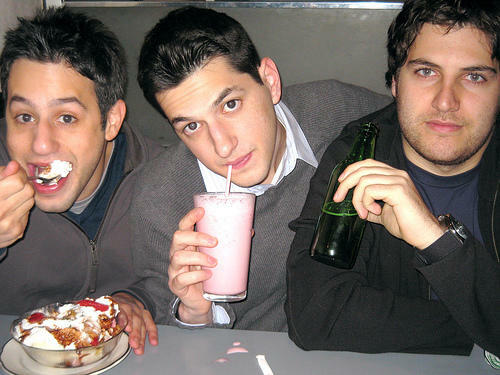 Hot Sauce features Ben Schwartz and Adam Pally as roommates and straight men for the crazy characters portrayed by the rest of the group. Jonathan Gabrus supplies the grossest moments as a bike messenger who mostly chews then spews hot dogs and eggs (picked up off the floor after being smashed). This really only plays on an infantile or frat-house level. Michael Martin redeems this somewhat as recurring neighbor “Barry Potter,” a deluded Harry Potter-wanna be. Also, interplay by Schwartz and Pally with Gil Ozeri as a pot-addled genie proves to be some of the smartest and best material in this show. The duo of Jessie Cantrell and Sarah Walker, as mentioned before, seem a little too taken with themselves. They seem to coast by on some mildly amusing banter, mostly derivative semi-parody of various movies and pop culture (like “Fight Club” and “Garden State”) lacking the sharp intelligent edge it ought to have. The section of the show that mines references to really obscure infant photography marketer Anne Geddes finds the duo making limp allusions to Geddes abusing them when they modeled for her as babies. Hot Sauce has its flaws but shows promise; Walker and Cantrell really ought to head back to the drawing board or the writing room at least.